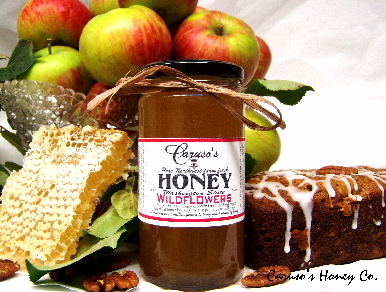 Baking with Gourmet Honey from Caruso's Honey Co.
Fall is here and the Holidays are fast approaching! Today our family picked apples and my girls and I had a great time baking with them using our honey. We made delicious Apple Pecan Honey Bread. Our farm fresh honey is not only a great gift idea for the holiday season, but it is a must have for all your holiday baking. Cream together butter and sugar. Add eggs, one at a time, beating after each addition. Add honey, sour cream, and apple chunks and mix. Sift dry ingredients together; add to creamed mixture. Stir in nuts. Pour bread batter into two well greased loaf pans; bake at 350 degrees for about 1 hour, or until toothpick inserted in center comes out clean. Makes two loaves.